Since the Great East Japan Earthquake that occurred on March 11, 2011, the energy situation in Japan has changed drastically. Nuclear power plants across the country stopped operation one after another, while renewable energy attracted attention as an alternative energy. 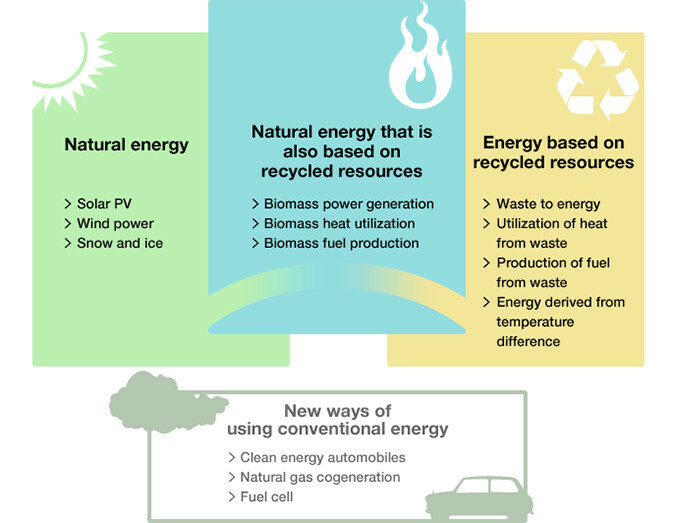 Main types of renewable energy include solar, wind power, geothermal, hydropower, and biomass. Among them, we deal with biomass, since it is less influenced by sunshine or meteorological conditions and can produce power stably throughout the year, day and night. As one of the base load power sources, we believe that biomass power generation is the most effective measure in terms of business profitability. We offer planning and consulting services for the design, development, and operation of power plants. In response to the need to reduce CO2 on a global scale, we are engaged in a type of business that utilizes the “electric power” and “heat” gained by burning biomass※1 as renewable energy. Fuel for biomass power generation exists extensively, and biomass offers a clean way of generating power as it does not increase CO2 levels. Furthermore, biomass is carbon neutral※2 even when it is burned. We strive to “contribute to local communities,” including local governments, by “creating new jobs” and “revitalizing local industries” through this business. Biomass refers to a renewable, organic resource of biological origin as opposed to petroleum and coal. It is a type of resource that is generated by living organisms using solar energy, water, soil, and the air in natural circulation. It will never be exhausted if it is used properly. ※2　What is carbon neutral? When trees are burned, CO2 is produced. However, when they grow, they absorb CO2 and emit oxygen. Therefore, CO2 in the atmosphere does not increase and the CO2 balance is considered to be net-zero. This idea is referred to as carbon neutral. All the power generated is sold under the feed-in tariff scheme (FIT). All the power generated through biomass power generation is sold to “General Electricity Utilities (i.e., 10 companies including Tokyo Electric Power Company, Inc.)” and “Power Producers and Suppliers (New Power Suppliers)”.